Parks staff are hoping to lure two wayward bison back into Banff National Park after they meandered out of their reintroduction zone last week. Parks Canada staff are hoping to lure two wayward bison back into Banff National Park. 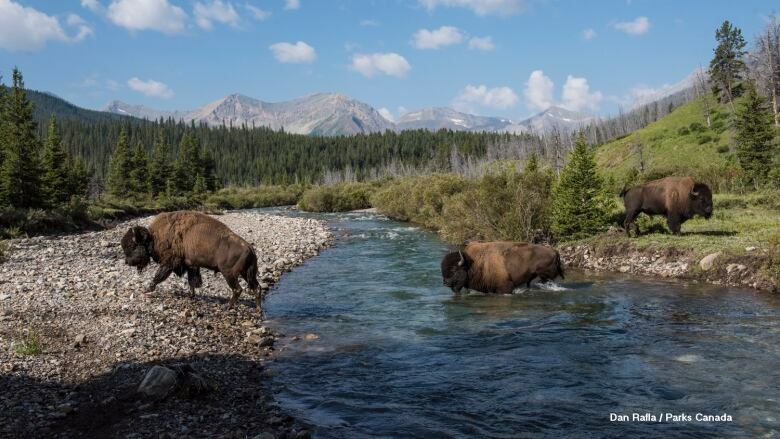 The two bulls, part of the first wild herd to roam in the park's backcountry in 140 years, meandered out of their 1,200-square-kilometre reintroduction zone separately last week to graze in the Red Deer Valley, said Bill Hunt, resource conservation manager for the park. "Both the bison are radio collared so we're able to track them. We get periodic updates from satellites and in addition, in the field we're able to follow them with a VHF transmitter," Hunt said. Hunt said staff have taken a lot of steps to keep bison in the park, and they're glad that most of the herd are still within five kilometres of the release area. "I think the fact that 31 of the 33 are still there is a really good sign. I don't want to jinx it," he said. Hunt said somewhat ironically, while the bison have wandered out of the park, they're still in Parks Canada's hands, as the pair have been grazing near Ya Ha Tinda Ranch where the organization trains horses and riders. The ranch is home to domestic bison that aren't part of the reintroduction program, but are used to help horses get accustomed to the ungulates. "We've invited people to bring their horses up, the bison are in a fenced area that the public can get access to so we've encouraged people to come and familiarize their horses with bison. Typically horses will react a bit spooked when they first see or smell a bison," Hunt said. "These are young animals, they're not very intimidating, so it's a great way to familiarize your horse before it's on the trail somewhere remote." He said it's no surprise to staff that the two wanderers are male. "Males generally want to walk around and understand what's around them and what their options are," he said, while the females are busy dealing with their young calves. He said staff try to get close to the bison occasionally to deter the animals from moving in certain directions, but "there's an old saying that, 'you can lead a bison anywhere it wants to go.'" Staff have also done some prescribed burns to make the bison's Banff habitat more attractive, with fresh new grass, Hunt said.